Conduct Denial of Service (DoS) attacks to prevent authorized users from accessing their server, database, important documents, etc. Be seven or fourteen characters long, due to the way in which encryption works. For obvious reasons, fourteen characters are preferable. Contain both uppercase and lowercase letters. Contain a symbol in the second, third, fourth, fifth or sixth position (due to the way in which encryption works). Not be your name, your friend's or family member's name, or your login. [Added by Talonz] Not be a significant or personal date. NEVER leave default installation files and passwords! 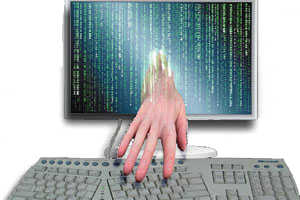 Hackers know the defaults and use them to gain easy access to others' assets. ALWAYS keep your operating system (Windows or Linux or Mac) patched. New vulnerabilities in operating systems are discovered nearly every day and OS creators rush "patches" to their clients to try to plug those holes. ALWAYS keep your applications patched, too. Applications are often a favorite target because of the lack of security in the rush to get the application to market ("never enough time to do it right but always enough time to correct the errors"). ALWAYS keep your communications secure. This means that your Internet connection is also vulnerable to the same patch problem. ALWAYS keep your antivirus program up to date with patches and virus definition lists. Once "malware" (malicious software) gets on your computer, it can spread rapidly throughout your network! ALWAYS use a STRONG password (see sidebar to the right) and change your password often (every 30 days is recommended) and do NOT keep it written down where others can find it! If you need YOUR computer or network evaluated, please use the form on the Contact page.